These days, CALL THE BAND is doing more and more tracks for BOLLYWOOD movies. 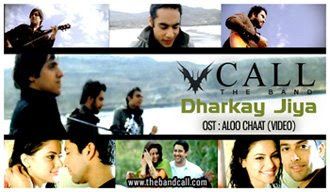 And once again, CALL THE BAND is back with their latest track DHARKAY JIYA from the movie ALOO CHHAT. The song’s lyrics have been written by Xulfi and Sami Khan(Lagan) .The video has been directed by Sohail Javed & Robby Garewal. The song features in Aloo Chaat (releasing worldwide March 20, 2009). The movie has Aftab Shivdasani and Aamna Shareef in lead roles! To download the song DHARKAY JIYA by CALL THE BAND, 'RIGHT CLICK' and 'SAVE TARGET AS' on the given link below. To listen the track, click on the blue PLAY button.